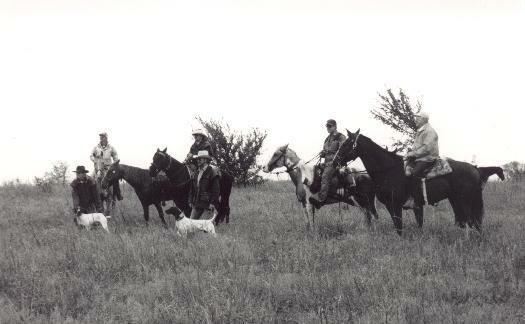 Field Trials are Sporting dog competitions under actual hunting conditions, which are divided into several classifications. Pointing Dog Trials, Beagle Trials, Retriever Trials, Spaniel Trials, & Hound Trials. We’ll discuss the Pointing dog Trials, since the Shorthairs are a Pointing breed. The object of field trials is the promotion and development of the high-class bird dog. It is a means of enjoying the great out-of-door sport of bird hunting in the most aesthetic fashion. It aims to provide competition of the highest kind among bird dogs, to stimulate enthusiasm among owners, and to act as a practical guide for breeders by setting a high standard of performance. Field trials mold opinions of conformation and perfect the mechanism of the ideal bird dog. There is a particular physical makeup of the well-bred bird dog that is indispensable to the performance of those duties wherefore he is highly valued. Without this equipment he is not so well fitted to perform those duties in a finished fashion. Bird dog trials thus influence physical standards. Although field qualities are all-important in the utility bird dog, it is desirable to have beauty of conformation, with brain power, intelligence, and bird sense. There are many different stakes in which a German Shorthaired pointer can be entered. Starting at puppy, going to Derby, onto Gun dog, or All-age. There are also classes for Amateur handlers, and limited stakes for the finished, seasoned dogs. If you have the competitive spirit, and feel you have a competitive dog, and you don’t mind traveling to the ends of the earth and would love to give up your weekends to sit in a saddle to watch your dog run and find birds, regardless of the weather conditions, then this just may be the "hobby" you’ve been looking for! There are many German Shorthaired pointer field trials and Hunting tests available to compete in, in most parts of our country. You can visit the American Kennel club: www.AKC.org and the German Shorthaired Pointer Club of America www.GSPCA to locate a club near you.